From a project standpoint, we can almost see the light at the end of the tunnel now. Soon, all the grass will be in the ground, and then Mother Nature will take over and call the shots for the remainder of the grow –in period. This past few weeks, we have witnessed a choreographed dance between construction and irrigation installation. Construction crews “rough grade” each hole. Only then can irrigation installation begin. They lay pipe from the tees to the greens, and position drainage in the bottom of the green core. Sprinkler heads are installed, and then load upon load of sand is trucked in so the green can be built. Soon, concrete paths are formed and poured. Next, the contractor needs to fumigate each green, but not until irrigation is complete and pressurized. You see, each green must be soaked with over a hundred thousand gallons of water before tarps go down. Fumigate. Wait two days. Remove the tarps, prep the surface, and then sprig. Sod the bunker faces, collars, and catch basins. Move on to the next hole. Repeat. Just when you get caught up, it rains heavily. Or it rains in Tifton, Georgia, where we get our turf from. So when you have to wait a day for a truckload of grass, you have to rearrange the schedule to stay relatively on the mark. Every day spent waiting or repairing the extensive washouts from rain eats into schedule, so that we are now about a week behind. Thankfully, there are ways to keep us on track, including sprigging the remaining holes at a higher rate, thereby allowing them to grow in faster and to open on time. So where are we in this process? The Front 9 is complete, with the exception of some areas that will need patching. 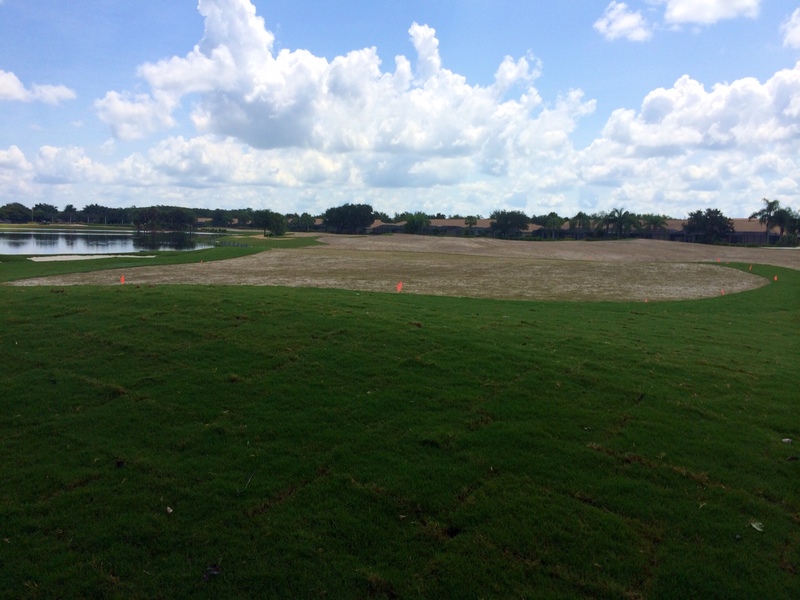 All tees, greens, and fairways have been planted with either sprigs or sod, and it is now in the process of growing in. Now to the Back 9: Barring a hurricane, this is pretty much how the remainder of the project will play out. Only holes #10 and #11 are without functioning irrigation, although all piping and sprinklers on both these holes will be completely installed by the end of this week. The control wiring is being run under the road from #18 to #10, and shortly, the entire course will have live irrigation. Irrigation is the lifeblood of the course, and soon it will be pumping water to the newly planted turf, controlled from the Golf Course Maintenance office, or from the Superintendent’s mobile iPad as he drives the course looking for trouble spots. The Practice tee is undergoing a final grade today, and being sprigged tomorrow. That is important if we hope to get the Range open sooner. Hopefully, holes #18 and #17 will be sprigged at the same time. I know, I know…#18 looks like a middle east war zone, complete with tunnels. But as they final grade that hole, it will clean up nicely. Fumigation is ready to begin on #18 through #14, and possibly #13. A final fumigation for #10, #11, and #12 greens will take place end of this week or early next week. Concrete is being poured at #14 tee today, and they may get around to the green by day’s end. Then concrete will continue in two directions..across to #15 and meeting up at the restroom on #16, and also to #10 heading backwards. While it doesn’t look like much progress is being made, those remaining holes will all finish up soon and be completely grassed by the first week in August. Yes, we need 90 days to grow the course in to a point where it will be playable. But if you increase the sprig rate, the grass will be planted closer together and it will grow in quicker, making up for lost time. As the roots establish, erosion becomes less of a factor, and therefore, less cleanup and replanting following a rain event. Daily afternoon storms are a nuisance, but the real damage could come from a tropical storm. Let’s hope and pray our weather pattern does not shift anytime soon. Your comments and questions are always appreciated. Hope you are having a great summer. Nice information to the folks. Thanks for the uptick. I would suggest you take a bit of time at least every two to three weeks to update us on the progress. Your detailed report was very much appreciated. Thank you to all who have worked on the golf course renovation for your hard work. We can’t wait to see the finished product. What a wonderful community we have in Spring Run. Our Striving motto is the truth. The concrete cart path at the green on hole 18 is too close to the green and should be moved closer to the Streamside’s property line. The problem is that the concrete path is now installed within 15 feet of the green which will cause any errant balls to bounce out of bounds. Although the green has been moved closer to the water, there is very little area other than being able to hit the green. Many higher handicap and older golfers will find the location of the current cart path unfair. Great job in describing the process Mike. I am sure everyone will have a better understanding of project. Mike, great job informing community of the course renovation!! I think you missed your calling; you could be a gold course supt!!! lol!